TAHER DESIGN is a luxury design studio based in Alexandria , Egypt that offers architectural & interior design. Our objective is to meet our client wishes by creating unique, royal and functional designs match there lifestyle and suits their budget. Since our inception, we have successfully completed many projects In Egypt ,Saudi Arabia ,UAE ,Kuwait ,Qatar and Cyprus. We offer a complete interior architecture and design service which is always individually tailored to meet each client needs, style and budget, We fully manage each project from concept to completion no matter what size, with meticulous attention to detail, supported by a team specialising in architecture and interior design. Muhammad Taher is an award winning architect & architectural visualization artist based in Alexandria, Egypt. He is highly experienced in exterior design, interior design, landscape and planning of residential compounds. In addition to these he has expertise in architectural visualization, specialized in lighting, and advanced materials, vegetation, interior and exterior renderings. Taher worked in Architecture and Interior Design for a combined 8 years and has extensive experience in both the commercial and private sector. his projects always combine a creative approach with a signature elegant and luxurious style. 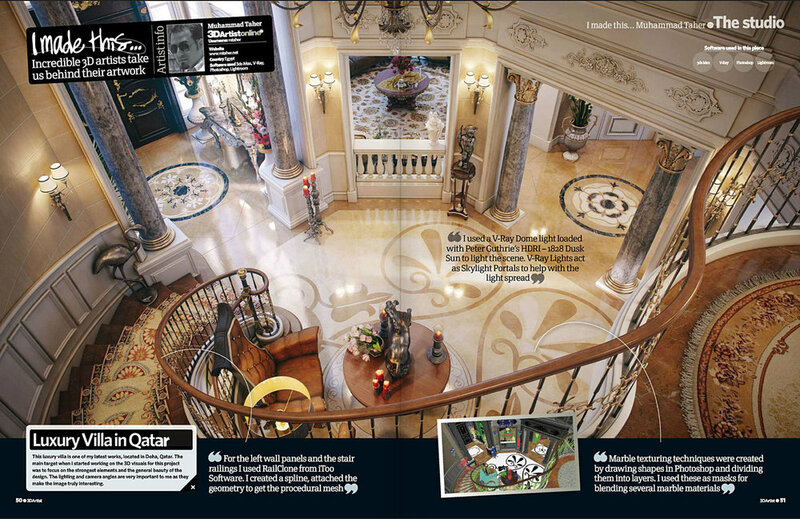 (LUXURY VILLA IN QATAR) FEATURED IN 3D ARTIST MAGAZINE – ISSUE 53, 2013.